Victoria musician Syl Thompson and his band have been paying tribute to the musical works of David Bowie for more than three decades. 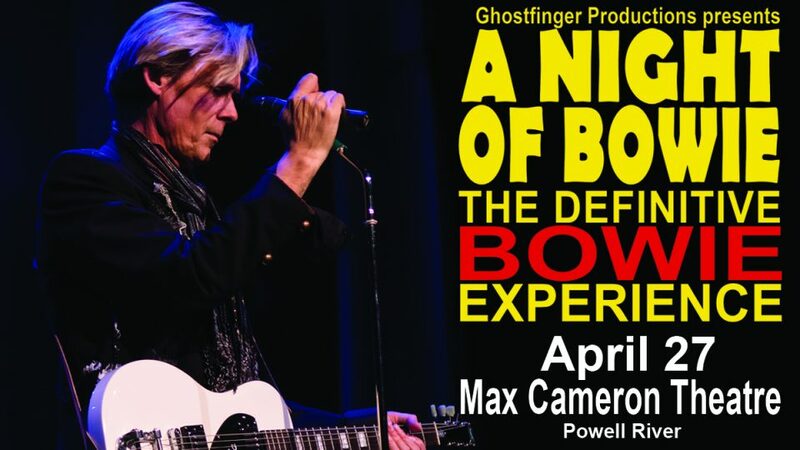 Thompson embodies Bowie’s exquisite style and persona and has been acclaimed as providing the most credible and realistic Bowie experience in North America. Six highly respected musicians play each song as Bowie and his band performed them live. The look and feel of this concert replicates the Heathen/Reality Tour. The music spans the broad spectrum of Bowie’s hits from 1969’s Space Oddity to 2013’s Where Are We Now? The show is eerily close to hearing and seeing Bowie himself. Thompson’s own musical journey has been chocked full of high points. In the early 80s, Thompson toured extensively in the South Pacific. Once he returned to Canada’s West Coast, he headlined for various cover bands and played in notable venues in Vancouver, including the Commodore Ballroom. In 1987, he opened for the Beach Boys at the Pacific Coliseum. Around this time, a manager of a Richmond nightclub heard him perform and remarked that Thompson had the look, moves and sound of Bowie and suggested he cover a few of Bowie’s songs. Before long, Thompson was dedicating a full set to the music of David Bowie. He renamed the band Major Tom and embarked on a year-long tour throughout North America. They played Las Vegas, Lake Tahoe and other major cities before returning to a Canadian tour which started on the East Coast. Musicians include Rob Begg, the original bass player, who has played with acts that included members of Berlin, The Knack and Tom Petty; John Gilliat, the original guitar player, who competed at the Montreal Jazz Festival and represented Canada at Japan’s 2005 Expo and Canada’s 2010 Winter Olympics; Kyle Radomsky on drums, from Farmer’s Daughters to playing with members of Loverboy, Pablo Cruise and Nearly Neil, Kyle can do it all; Graham Howell, who played with the 80s band Skaboom and later with Powder Blues Band, is on saxophone and flute. Rounding out Ground Control are life-long friends of Thompson, brothers Marc Gawthrop of Teen Angel and Rob Gawthrop of Steelback.